Need Help with a DUI Defense? Getting arrested for DUI is not easy. It’s a scary and confusing time. You probably have a lot of questions running through your mind right now. Getting arrested is a scary time. You deserve the information you need to know to protect your rights before even hiring a lawyer. Getting arrested for domestic violence charges in South Florida is scary. Free report reveals how to protect yourself and your family. You deserve a lawyer who not only knows what they’re doing, but who also makes you feel comfortable and empowered during this awful time. One of the best ways to gauge whether you’ve found the right attorney for you is by reading reviews from former clients. Every lawyer has a different approach in how they handle people, and you need to hire the lawyer who makes you feel good about your situation. Every day, good people find themselves in bad situations. A mistake is made or an accident happens, and individuals who have never had trouble with the law before are now facing a serious legal charge. Maybe you got behind the wheel after one too many drinks, or a private family dispute escalated unexpectedly. Criminal and driving under the influence (DUI) charges carry serious consequences in Florida, and at these times, it is natural to feel overwhelmed. It can be difficult to deal with the uncertain future and fear of the unknown. You may know you need help, but you are not sure where to find it. At Rossen Law Firm, criminal defense attorney Adam Rossen has been providing aggressive representation inside the courtroom, as well as thoughtful and compassionate advice outside of it. After years working as a prosecutor in Broward County, Adam turned his focus to protecting the rights of those charged with a crime. Today, he uses the unique knowledge and skills developed as a prosecutor to help his clients minimize the negative consequences of their mistakes. 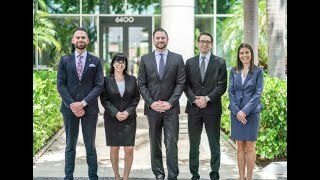 Proven with more online reviews than any other lawyer in the Fort Lauderdale area, Adam has built a reputation for being both extremely effective and easily accessible. If you are facing a DUI or criminal charge in Broward County, put your trust in the attorney who has helped so many others who have been where you are. Former clients have left numerous online reviews, calling Adam Rossen determined, available, and goal-oriented. Most importantly, Adam has been able to help his clients obtain the best possible legal outcome so that they can move forward to a successful and secure future in line with their personal goals. Whether you live in South Florida, or you need to resolve a legal matter in Florida from out of town, contact our office today to schedule a free strategy session with Adam and learn more about protecting your rights. I was able to sleep easy in jail knowing I had Adam representing me. An experienced advocate. Working for years as a prosecutor, Adam understands intimately how the system works and can anticipate the approach of the other side. He is very familiar with the local courts, and he focuses solely on DUI and criminal matters, allowing him to develop knowledge and know-how other lawyers simply may not have. A lawyer who gets results. Read any of Adam’s many online reviews, and you will find that his clients are happy with their outcomes. Determined and knowledgeable, Adam works tirelessly to explore and pursue every legal angle for success. An accessible partner. Every client has Adam’s cell phone number, and they know they can rely on him to share frequent updates and answer their questions. He works with his clients to formulate a plan of action together that will meet each individual’s unique goals. A calm and confident leader. Understandably, many clients visit the offices of Rossen Law Firm feeling nervous and upset. They are met with respect and compassion. Adam makes it a priority to help every client understand their rights and local law, so they can feel confident going forward. 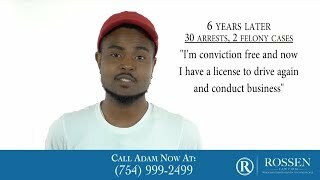 Sometimes, bad things do happen to good people, but it is possible to move forward with help from Adam and his legal team.